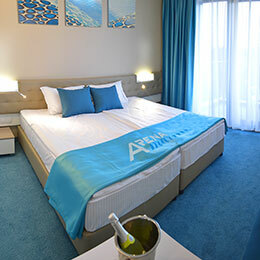 Smartline Arena Mar comprises 200 luxurious and brightly furnished rooms. Room types: Double room (a total of appr. 23m2, including bathroom; living area – 14m2 ) with view to the commercial street, pool, or with partial sea view, for 2 adults +1 child or 3 adults. Family room (x a total of 27,4 m2 including bathroom; size of the living area – 19,6m2) with view to the courtyard or to the commercial street for 3 or 4 adults, or 3 adults and 1 child.